Buying a home is exciting. It’s also one of the most important financial decisions you’ll make. Choosing a mortgage to pay for your new home is just as important as choosing the right home. You have the right to control the process. Check out our other blogs on homebuying topics, and join the conversation on Facebook and Twitter using #ShopMortgage. One of the toughest parts of buying a home for the first time is coming up with a down payment. You may have heard that in order to buy, you should have 20 percent of the total cost of the home saved up for the down payment. Actually, you can choose how much to put down based on what works best for your situation. Putting 20 percent down has a lot of benefits. However, saving enough money for a 20 percent down payment can be challenging, especially for first-time homebuyers. And, the money you put into your home is not available for other things, such as emergency expenses or other savings goals. There are a variety of mortgage options that allow you to make a down payment of less than 20 percent, but lower down payment loans are typically more expensive. In general, the less money you put down upfront, the more money you will pay in interest and fees over the life of the loan. According to the National Association of Realtors, the median home price nationwide for the year ending June 2016 was $227,700. A 20 percent down payment on this median-priced home would be $45,540; a 10 percent down payment would be $22,700; a 5 percent down payment would be $11,385; and a 3.5 percent down payment would be $7,960. In this blog, we show you how the amount of your down payment affects your mortgage costs, so that you can choose a down payment that’s right for you. If you want to buy a home but can’t afford a 20 percent down payment, you will likely have to pay for mortgage insurance. Mortgage insurance protects the lender if you fall behind on your payments. 1. You’ll have a smaller loan—which means lower monthly payments. With a larger down payment, you borrow less, so you have less to pay off. That means your monthly payments will be lower than with a smaller down payment. 2. You’ll have lower overall costs. When you borrow less, you’ll pay less interest on your loan. That’s because the interest is calculated using a lower loan amount. When you put down at least 20 percent, you also typically won’t have to pay for mortgage insurance. Mortgage insurance increases your monthly mortgage payment. 3. You start out with more equity, which protects you if the value of your home goes down. When you make a larger down payment, you have more of a cushion in case home prices decline. With a smaller down payment, you have a higher risk of owing more than your home is worth if market home prices decline, like they did between 2008 and 2012. If you owe more than your home is worth, it can be very hard to sell or refinance your home. Where did the 20 percent number come from? The “20 percent” threshold is based on guidelines set by Fannie Mae and Freddie Mac, government-sponsored companies that guarantee most of the mortgages made in the U.S. To qualify for a Fannie Mae or Freddie Mac guarantee, a mortgage borrower must either make a down payment of at least 20 percent, or pay for mortgage insurance. That’s because mortgages with down payments less than 20 percent are considered more risky for the lender. Not all mortgages are guaranteed by Fannie Mae or Freddie Mac. Low down payment mortgages are offered through other government guarantee programs, such as the Federal Housing Administration (FHA), U.S. Department of Agriculture (USDA), and Department of Veterans Affairs (VA). Those programs also require mortgage insurance or other fees. Some lenders may offer their own low down payment mortgage programs that do not require mortgage insurance or participate in any government guarantee program. Those loans typically charge higher interest rates in order to compensate for the lack of mortgage insurance and guarantee. No matter what kind of loan you choose, if you put down less than 20 percent, you can expect to pay more for your mortgage than if you put down at least 20 percent. While making a larger down payment has benefits, it’s not uncommon to make a down payment that is less than 20 percent of the purchase price. There are a variety of different loan options that allow for a low down payment. A conventional loan with private mortgage insurance (PMI). “Conventional” just means that the loan is not part of a specific government program. Typically, conventional loans require PMI when you put down less than 20 percent. The most common way to pay for PMI is a monthly premium, added to your monthly mortgage payment. Most lenders offer conventional loans with PMI for down payments ranging from 5 percent to 15 percent. Some lenders may offer conventional loans with 3 percent down payments. A Federal Housing Administration (FHA) loan. FHA loans are available with a down payment of 3.5 percent or higher. FHA loans are often a good choice for buyers wanting to make a low down payment. However, borrowers with higher credit scores or who can afford a somewhat higher down payment (5 to 15 percent) may find that an FHA loan is more expensive than a conventional loan with private mortgage insurance. 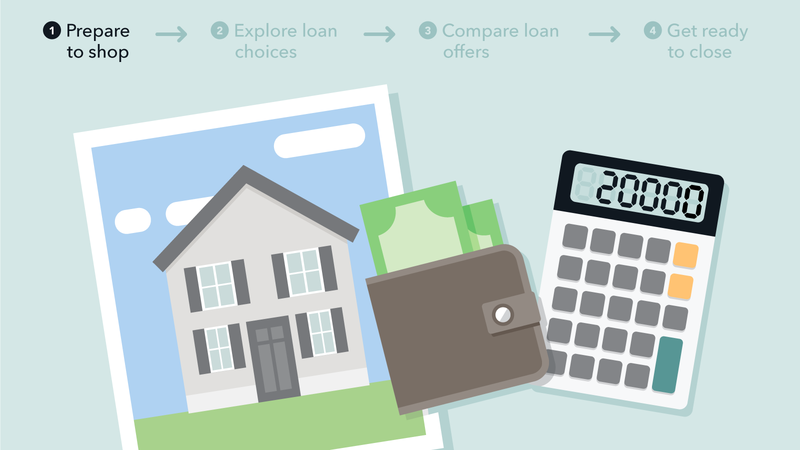 Compare different loan options before making a decision. Special loan programs. Special zero down payment programs exist for veterans, servicemembers, and rural borrowers. State and local programs may offer down payment assistance or other special loan options for low-and-moderate-income families, public service employees, and other specific populations. Depending on your situation, these programs may or may not be a better fit for you than an FHA or conventional loan. Make sure to compare the full cost of each option before making a decision. There are two key steps to making a decision about how much to put down. First, assess how much money you can afford for a down payment. Second, explore your loan options with lenders so you can understand how your down payment choice affects your overall costs. See how your down payment amount affects how much your mortgage will cost overall. The first step is to figure out how much money you have available for upfront home costs. If you haven’t already, gather your most recent savings and investment statements so you start with an accurate number. As you decide how much you can spend, make sure you still have enough money available for emergency savings, other savings goals, and closing costs. You might be tempted to put down the maximum down payment that you can afford. However, it’s important to have emergency savings and cash on hand to pay for unexpected expenses and critical home maintenance. A good goal is to build up an emergency fund with at least three months of living expenses before you move in. Putting money into your home means it’s not available for other expenses—that’s one reason you need a separate emergency fund. Once you put money into your home, it’s not easy to get it back out again. If you need the money for another major expense, like paying for college or medical expenses, you may find that there is no way for you to access this money. Home equity loans or lines of credit allow homeowners to borrow against their equity, but you usually need to have significant equity in order to qualify. Keep in mind that you’ll also have to pay closing costs on your loan. Typically, these costs are paid upfront using the same savings that you are using for your down payment. For example, suppose you are hoping to buy a $200,000 home and you have determined that, after accounting for other savings goals, you have $30,000 available for upfront costs. Assume your closing costs are about $10,000 (the actual amount could be more or less). That means that the amount you have available for a down payment is actually only $20,000, or 10 percent of the home price. Learn more about what to consider when deciding how much to put down. For personalized advice, consider meeting with a HUD-certified housing counselor. Choosing the right down payment amount for you is unique to your financial goals and personal situation. Knowing how your down payment amount affects your mortgage options and how much you will pay for a mortgage puts you in control to find the best loan for you. Talk to multiple lenders and ask them to show you different loan options for different down payment levels. Ask what they recommend and why. But, there’s no need to decide on a specific lender just yet. If you’re just getting started saving, or if you decide you want to save up more before you buy, we have some tips to help you build your down payment savings. Research shows that the best way to achieve your goals is to make a clear plan and then make it as easy as possible for yourself to follow that plan. Start saving now. You don’t need to have your down payment figured out to make your first deposit. Consider opening a separate account specifically for your down payment funds. That way, it will be easier to keep track of your progress and avoid spending the money on something else. Make a plan. How much do you have saved now? How much will you need? Chances are you already have some idea of the home prices that are typical in the area where you are considering buying. Calculate a range of down payment options by multiplying your desired home price by 5, 10, and 20 percent. Add another 2–5 percent of the home price for closing costs. How do these numbers compare to how much money you currently have saved? Now, take a look at your monthly spending and decide how much you can afford to save each month. How long will it take for you to achieve your savings goal? Schedule your savings. If you can, set up a regular deduction from your paycheck to be automatically deposited into your down payment account. By making savings automatic, you’ll be more likely to stick to your plan. Research available assistance. Many states and nonprofits have programs and benefits that can help first-time or low-income homebuyers . Ask lenders for information on programs specific to your situation and where you live. Consider meeting with a HUD-certified housing counselor, who can give you independent advice about your options. You can also go online to explore programs in your area . Gifts from family or friends. In most cases, you can use gift money from a family member or a friend for your down payment. However, some kinds of mortgage loans do not permit you to use gifts for your down payment. Ask loan officers whether gift funds are allowed and what documentation of the gift is required for the mortgage options you are considering. Like most aspects of buying a home and shopping for a mortgage, the down payment that works for someone else may not be the right choice for you. Take time to explore your options and compare the costs to make the best choice for your financial situation. We’ve got a lot of information on our site already to help you get started. Visit "Buying a House" to help you navigate the process all the way to closing. Check out Ask CFPB, our database of common financial questions. Ask us questions. We’ll feature some of the most frequently asked questions on our blog this spring. Sign up for our 2-week Get Homebuyer Ready boot camp. We’ll take you step-by-step through the entire home buying process.